This cake is for a baby shower. I used the 2 cake mix Wilton book pan. I then used a 10 1/2" loaf pan and another cake mix and made 2 loaves. I cut the loaves into 3 equal pieces and trimed them so they would be flat. I stacked 2 equal pieces with buttercream inside to be blocks. I iced all of it in buttercream, let dry then used a Viva towel to smooth. The turtle, frog, snail and letters are made from candy melts and a mold. The duck is white chocolate. The other things are cupcake toppers/ that are on the blocks. The hands and feet are gum paste. 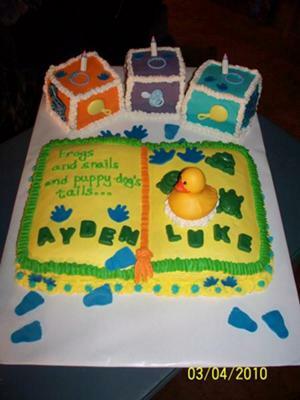 YOU CAME UP WITH A CUTE AND FUN CAKE FOR A BABY SHOWER. I LOVED IT. I'M SURE YOUR CLIENT LOVED IT ALSO. THAT WAS A GOOD IDEA WITH THE BOOK PAN.